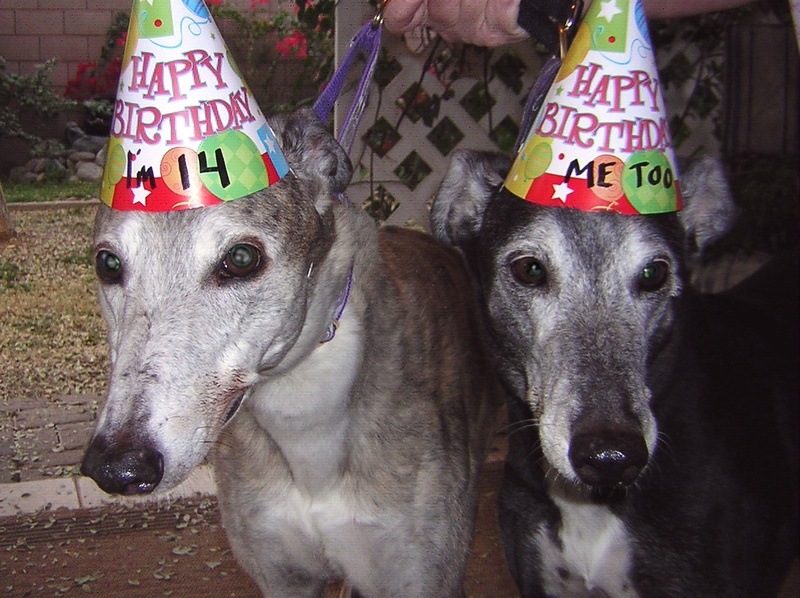 Rosie, on the left, (Bobs Rozier) turned 14 on Nov 2, and Roulette (Coldwater Coleta) turned 14 on Dec 17. RAINBOW BRIDGE update: Rosie passed away on Oct. 21, 2010; she would have turned 15 in 11 days. Roulette passed away on Nov. 12, 2010; she would have turned 15 in 35 days. Both long-time beauty queens, have left a whole in the hearts of those who loved them. Both greyhound golden girls belong to Dave & Caryn in Arizona. Rosie was adopted from HemoPet and Roulette from Greyhound Adoption League. Roulette still runs in circles and Rosie still counter surfs. Her latest score was a loaf of bread off the island while daddy Dave was engrossed in watching football on TV. Amid all the awfully sad news we often see involving greyhounds, this story is a welcome relief! How wonderful it is to see these two beautiful senior greys ! Thank you so much for taking care of Rosie. We were together for 8 yrs until I lost my house and business that I have to give her back to Hemopet in 2008. Counter surfing??? Yup, that’s Rosie! I have lots of memories of her including a heart stopping jump from the 2nd floor all the way down to the ground trying to race with my other grey boy.